The CII have now released the question paper from the April 2015 AF5 Financial Planning process exam so we can compare what came up with what we predicted would come up in our analysis. It was pleasing to see straight away (and always a relief!) that we predicted all of the objectives correctly – both the immediate ones and longer term objectives. The first question was, as usual, around identifying the additional information you’d need as an adviser to help the clients with their immediate and longer term objectives. 30 marks are available here and it’s pretty much always the first question – there’s no excuse not to have prepared well for this, and anyone using our analysis would have ensured most of the marks, if not all, would have been picked up. The second question usually covers risk, and in this paper, 6 marks were on offer if delegates could outline the steps an adviser should follow when using a risk profiling tool. Part (b) of the same question then asked for 5 benefits and 5 drawbacks of using such a tool, for a total of 10 marks. We covered the steps/process in full and also what the drawbacks are – but sadly not specifically the benefits! Oh well, still not a bad 11 marks out of a possible 16. This one was around their existing pensions and investments. Part (a) asked delegates to explain why the funds in both pension plans may not be suitable to meet Peter’s retirement objective – we had of course mentioned the funds Peter is invested as they didn’t match his risk profile at all, however we don’t believe we had enough for a full 12 marks. It seems more detail was needed around with profits. Part (b) asked students to recommend and justify actions to improve the tax efficiency on their portfolio/savings – thankfully we had plenty of information within our analysis including a recommend and justify table, so the 15 marks available here should easily have been achieved. The fourth question was around the administrative responsibilities of Peter as an employer in respect of auto enrolment – our last two pages of analysis were on auto enrolment, and so we are confident that the 9 points the CII were looking for were here. 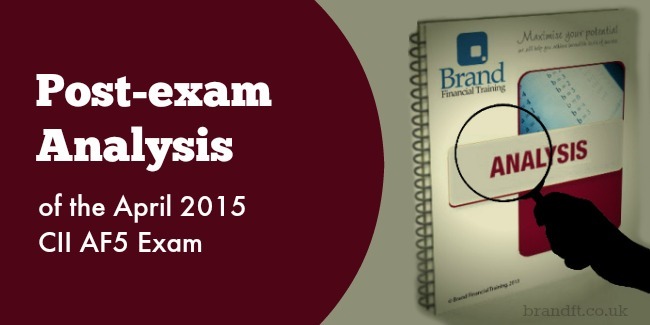 This useful post takes a look at the questions that came up on the #CII’s April #AF5 exam. Onto the long term care objective and question 5 asked for a justification as to why an immediate needs annuity could be used to meet an income shortfall – 10 marks were on offer here, and we had the features covered, how it would suit the circumstances of Peter’s mother as well as the pros and cons – a confident 10 marks in the bag. Part (b) asked for an explanation of Peter’s obligations as a power of attorney – sadly we didn’t see this coming at all – luckily only 7 marks missed. The sixth question was on the university fees objective; students were asked to comment on the weaknesses in using a regular savings plan – there were 8 marks here and the second part of the question asked for the benefits of using a student loan to fund costs with the loan being repaid from the savings plan – 9 marks here. Our section on university fees focused on what he should do, which did include retaining the savings plan – the information could have been adapted to answer this question, but we didn’t cover any information on student loans. This one was a dream of question – 37 marks on protection! Delegates were asked for 12 weaknesses in their protection arrangements, and these were easily covered off in our analysis. Part (b) asked for a recommendation and justification of a product to cover illness – 15 marks on income protection easily covered in the analysis. Part (c) was another recommend and justify question, this time on the actions Peter could take around his pension death benefits – 10 marks available here, and most, if not all, covered on our section on spousal by-pass trusts. Anyone fully prepared on protection would have been delighted to have seen so many marks on offer. Ever the review question – 7 events were needed that would trigger an immediate review – we gave 11 circumstances, some of which were generic and six were specific to the clients. This question should always achieve maximum marks. We feel this is our best analysis so far – we firmly believe that with a 55% pass mark delegates who used our April analysis would have passed this paper with flying colours. If you’re studying for your AF5 exam, and you’re feeling a bit anxious about exam day, grab our free fact-find analysis, from an earlier exam sitting, to see the analysis layout and content style for yourself. Click the link to download the AF5 free fact-find analysis now! If you’re sitting the exam in October, which areas do you think will prove the most challenging for you in your exam revision? This post is brought to you by Brand Financial Training.